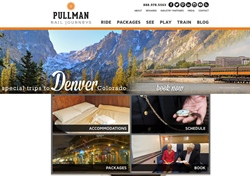 Pullman Rail Journeys, one of the Premier Rail Collection product offerings has experienced an upgrade to their website with the help of Idea Marketing Group, Chicago web design and marketing firm. Integration has been handled cleanly while maintaining much needed flexibility for future development and new products. Pullman Rail Journeys takes travelers across the country in classic Pullman rail style reminiscent of the golden age of rail travel. Listed as one of National Geographic’s Best Tours in America 2015, Pullman Rail Journeys transport passengers to a different era of travel with an extraordinary view of America. With Chicago train packages to and from New Orleans and Denver, one way or round trip, guests experience an iconic journey in historically restored Pullman railcars upgraded with modern conveniences. Premier Rail Collection hired Idea Marketing Group to redesign and develop a new mobile-friendly online user experience for each of their railroad experiences. For Pullman Rail Journeys, attention was focused on driving new travelers to the website to showcase upcoming trips, a thorough overview of available trips and an easy-to-use flow to book tickets on this classic train ride were all carefully addressed. Idea has developed a new Wordpress Multisite configuration for Premier Rail Collection. Each rail line has a separate website, but they are connected from the backend with one login and scalable layers of administrative access. The custom designed Wordpress template was created to work for each railroad but also customizable enough to allow individuality from the sister train lines. Idea also integrated Softtrip, the ticketing system specific to Pullman Rail Journeys for a seamless ticket buying experience. The site is mobile responsive, optimized for search and features new improved navigation with forethought towards scalability for growth. Check out Pullman Rail Journey’s new travel website. Idea Marketing Group, located just west of Chicago, offers web design, web development, and marketing services to clients nationwide. With additional specialties in branding, graphic design and marketing services. Idea draws from experienced, in-house talent paired with unmatched customer service at award-winning levels.